Everyone has heard about alternative modes of transport offering major benefits in terms of costs, reduced environmental impact and less congestion on roads. There are complexities however: co-ordinating ship, rail, barge and truck movements is a major headache for anything other than the simplest combinations. Many opportunities are missed - bear in mind that logistics planners have to cope with hundreds or thousands of freight movements per day, so they can ill afford to spend time hunting for the best solution for every single transport order. e-Freight, a consortium of 30 partners across Europe, supported by the European Commission, has tackled this problem with an innovative approach which will radically change the way multimodal operations are managed. Key to the solution is a real-time automated co-modal transport optimization system (known as ReACTION) developed by MJC² which uses live data from the e-Freight platform to optimize the multimodal logistics chain. 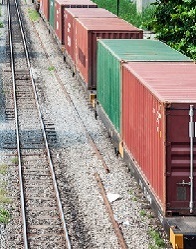 The ReACTION system will encourage the use of greener modes such as rail and barge for freight movements, while allowing freight operators to offer cheaper, more flexible and efficient services to their users.